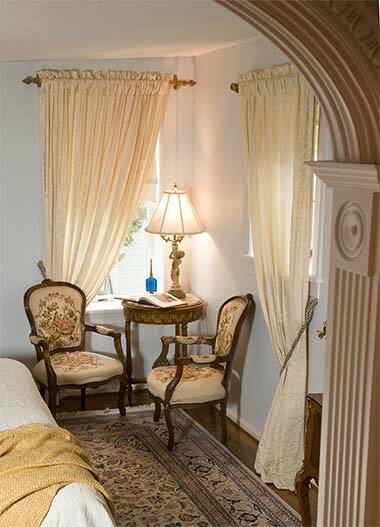 Leave behind the fog of everyday life and find luxury lodging in Annapolis, Maryland within our exquisite townhouse. Each of our suites conveys its own unique individuality, and we invite you to select the one whose beauty captivates you and insists on being selected. All of our accommodations are meticulously appointed to aesthetically entice you and exceed your expectations with an incomparable level of comfort, elegance and superior quality. Your King size bed is one of a kind, constructed of all natural bamboo latex for a caressing firmness that seduces you into a night of dreamy sleep. Both antimicrobial and hypoallergenic, there is no need to worry about allergens of any type that may disrupt your sleep. Your bed is also dressed in the finest imported Italian bed linens of 100% long weave Egyptian cotton, providing an incredibly soothing softness for your entire body that convinces you that you will never want to leave. 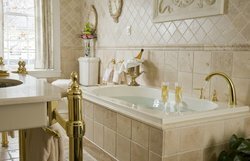 Each suite is also situated on different floors of the Inn with no shared entrances, baths or walls, offering you maximum privacy within our Annapolis lodgings. Your private bath has been designed to meet the most meticulous standards of cleanliness, functionality and beauty. 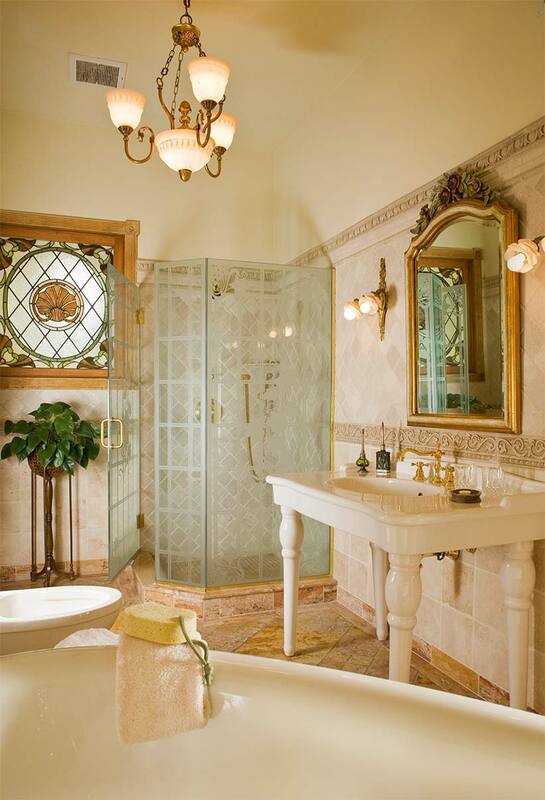 Imported Italian marble enhance the floor and walls. Exquisitely designed etched glass shower doors and enclosures, hand showers, heated marble floors, polished brass towel warmers, bidets and massage therapy tubs pamper our guests and flatter them with feelings that their every need has been anticipated and satisfied. We also provide comfortable luxuriously soft and ultra-absorbent Turkish cotton towels, terry cloth robes and a variety of bathroom amenities. The Inn, itself, is centrally air-conditioned, and each of our suites has its own thermostat to ensure that each of our guests can adjust the temperature of their room to their precise comfort level. The Inn also has a reverse-osmosis water filtration system providing crystal clean water to each suite. Our endless hot water supply guarantees our guests uninterrupted hot water for those who enjoy lingering in their shower. Unlike many Airbnb and other rental properties, we satisfy and exceed all rigorous safety and fire inspection requirements demanded by the Historic Preservation Commission and the Annapolis Municipal Public Works Department here at our lodgings in Annapolis, Maryland. The soft blue entrance of The Iglehart Suite with its Georgian archway leading to the bedroom draws you deeper and deeper into a feeling of tranquility and serenity with every step you take. 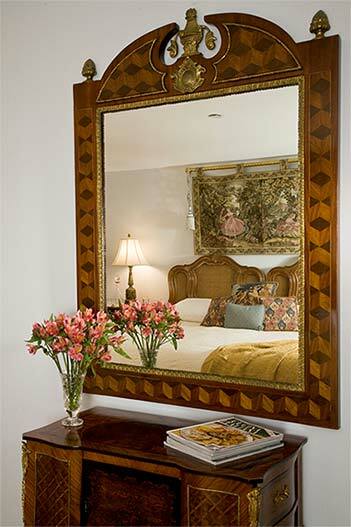 The Iglehart Suite is a peaceful oasis of natural beauty, a mantra of pure rest and relaxation. When you close the door behind you, the twenty-first century world is forgotten. A magnificent antique secretaire stands beside your bed with inlaid wood and exquisite detailing. The separate vanity area is a spacious alcove with a customized distressed wood vanity below an oversized marble countertop with ample space for all of your amenities. Your private marbled bath completes your own little sanctuary with small touches such as a towel warmer for tasteful luxury. The Iglehart suite is perfect for the getaway couple or business traveler, searching for physical and mental refreshment. A private sitting area with a garden view from your room. A garden view right from your room. A spacious three-room suite is magnificently appointed with furnishings of unquestionable elegance and sophistication, The Murray Suite is the epitome of luxury and finesse, and it is truly the jewel in the crown of The Annapolis Inn. 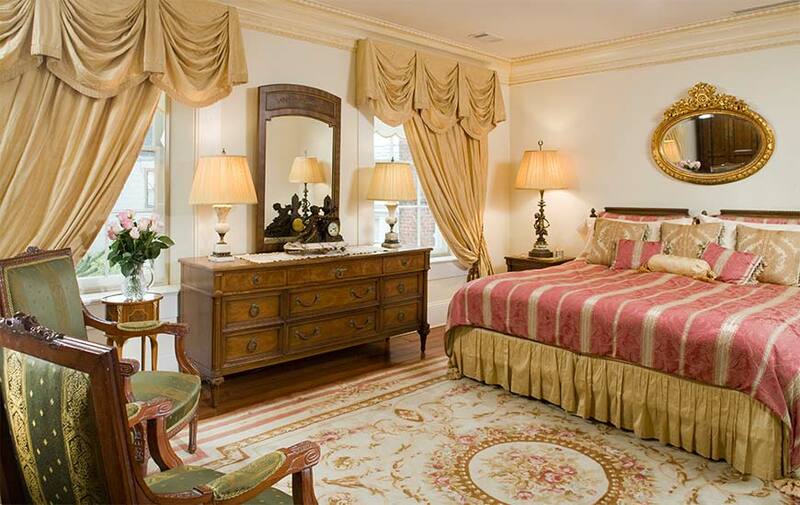 The Murray Suite bears an aristocratic air of incomparable elegance in Annapolis. 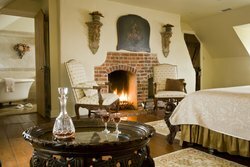 The grand master bedroom with its king size bed offers a comfortable sitting area with two silk arm chairs and cigarette table in front of its fireplace, and resting on a rich, deep piled Persian rug. 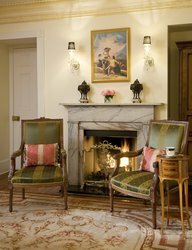 Its sitting room, separated by the Inn’s most exquisitely and elaborately designed etched glass doors, offers more spacious seating with a sofa, coffee table and two additional silk arm chairs in front of the Suite’s second fireplace. 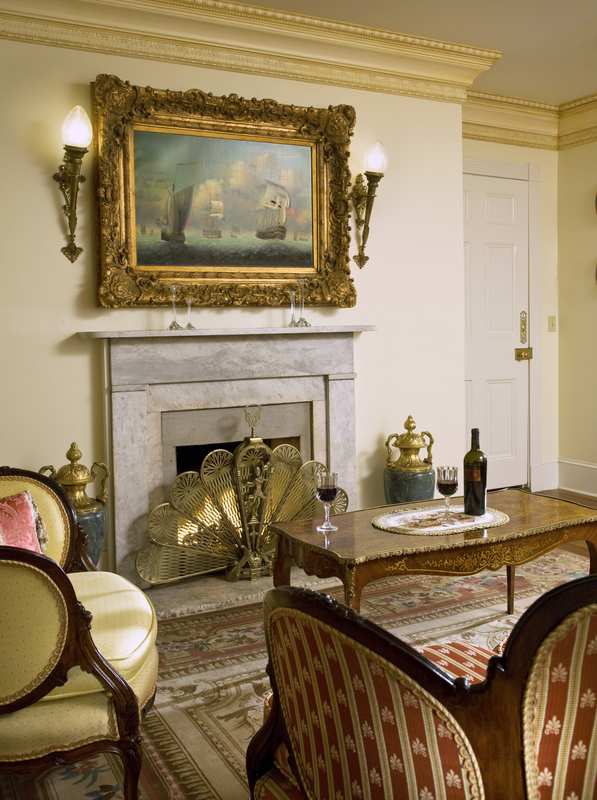 The Murray Suite bears an aristocratic air of incomparable status in Annapolis. Authentic historic bedchambers extend to the washroom which has been refurbished with a massage therapy tub, a stall shower and heated floors. The whirlpool tub and towel warmer promise absolute comfort, sending you off for a night of divine sleep. There is a Queen size Murphy bed in the sitting room for a son or daughter to enjoy, with the choice of closing the doors between the two rooms so you may each enjoy your own privacy. The Murray Suite promises to provide you with accommodations for sophistication and space. The Murray Suite has a Queen size Murphy bed for your son or daughter. 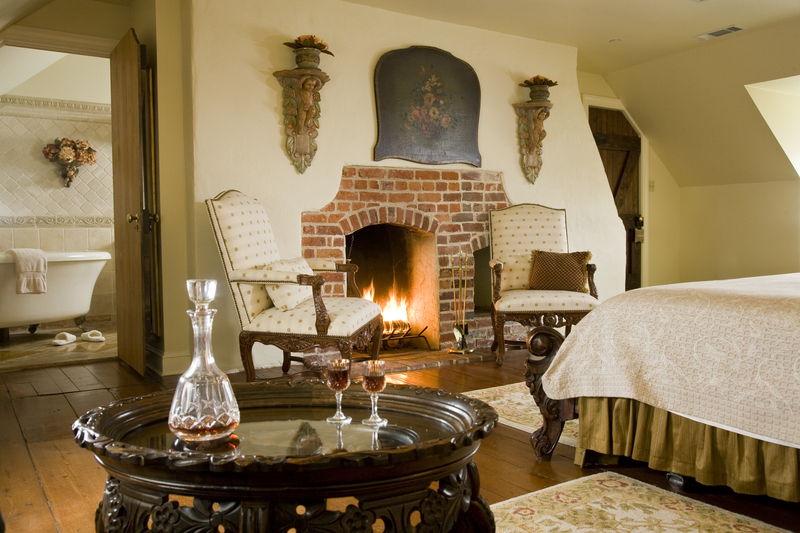 A room with a fireplace is made for romance. 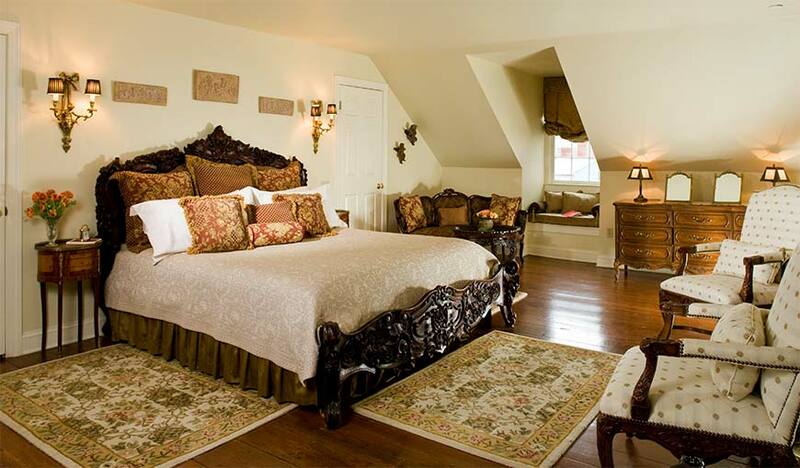 The Rutland suite has a King size bed and features a wood burning attic fireplace, claw foot whirlpool tub, and a private sundeck with view of garden and Koi pond. 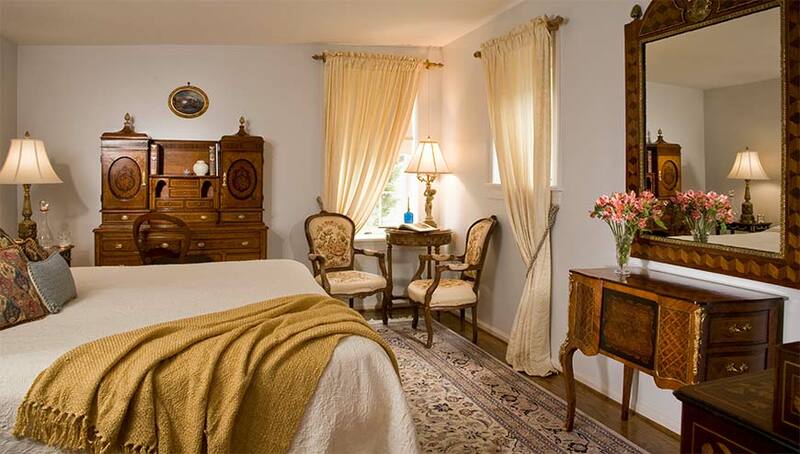 These Annapolis accommodations celebrate a couple’s privacy and allow for the ultimate luxury and comfort within your own suite and sitting room. 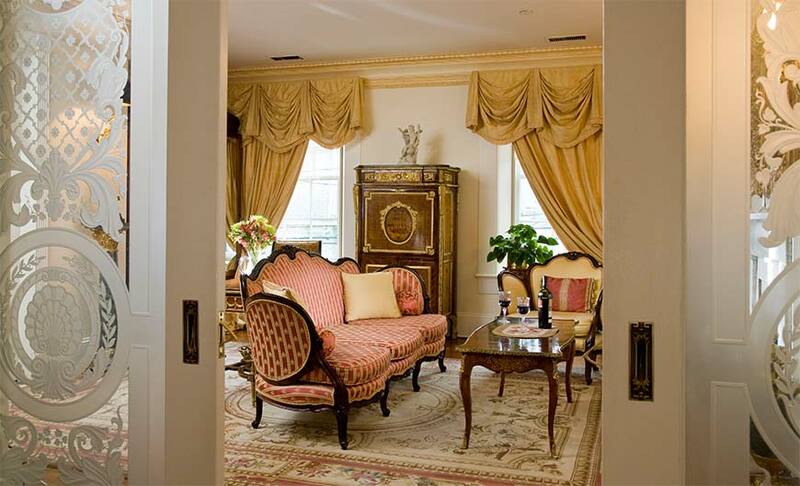 The imported London silk shades and window seats with brocade pillows allow guests to lounge. The room is exquisitely furnished with rich rugs that complement the warm glow of the fire. With furniture such as an antique settee and hand carved table, you have a completely indulgent and romantic atmosphere to celebrate your partner. The marble bath has a double vanity, massage therapy tub, stall shower, bidet, heated floor, and towel warmer. Experience absolute relaxation and decadence that you may never feel again. 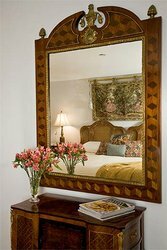 The Rutland Suite is the perfect suite for celebrating love. Celebrate a special occasion in this intimate and beautiful suite. A wood-burning fireplace is the ultimate luxury. Enjoy modern conveniences and relax in your private bath.